Late summer is the most delicious time of year for local produce. A visit to any farm stand is sure to inspire a wonderful new meal. Check out this vegetarian dish I made with zucchini "spiralized" into a "pasta" and all locally farm-grown produce. Late summer is the most delicious time of year for local produce. A visit to any farm stand is sure to inspire a wonderful new meal. Last week I was on my way to a historic barn venue near Hudson, New York where we were catering a wedding the following day, when I spotted Eger Brothers Farm Stand up ahead. I was amazed at the bountiful selection of produce they had on display, ALL grown in their own fields. I rarely shop for food (why bother when I have a whole kitchen cranking out great food day in and day out?) but the overflowing bins of beautiful vegetables were just screaming “buy me, buy me”! The perfectly formed zucchini really caught my attention after hearing friends talk about how fun it is to make zucchini “pasta” with a “spiralizer”. I’d purchased one of these devices a few months before and never used it, so I bagged up four of them. Local corn is sweet and delicious right now - so six of those were a slam dunk in my basket. Who knew artichokes grew on the east coast? Well they do at Eger Brothers - and they were small and beautiful so I snared six of those as well. Early fall is also a great time for squash in the northeast. They had every variety - but since I seemed to be moving towards a vegetarian “pasta” themed dinner, I picked a nice looking spaghetti squash. I knew I had an abundance of cherry tomatoes growing at home and had recently been gifted some beautiful tomatoes from a friend’s garden - so the bones of a wonderful meal were all here and beginning to evolve in my mind. When I got home, I prepped all my vegetables and put them in separate bowls. A sweet onion was chopped fine and a few cloves of local garlic readied for the press. 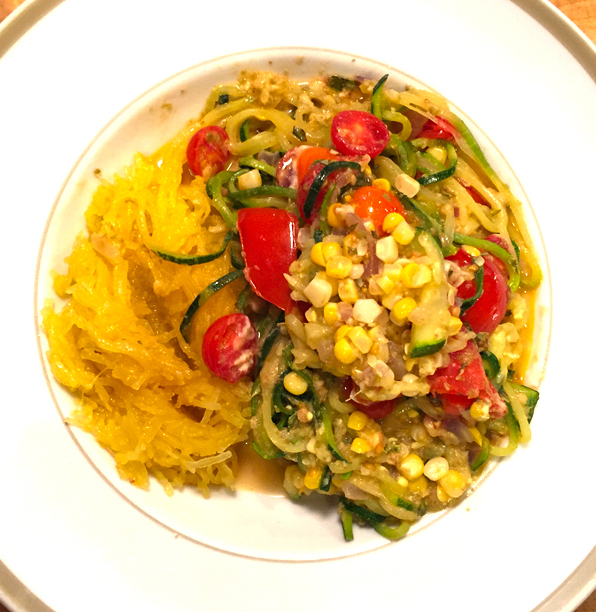 I “spiralized” two large zucchini to make up the bulk of the “pasta” dish, cut up the tomatoes, and striped the corn off the cob. My home garden has a nice selection of fresh herbs, so I picked some basil and parsley and chopped them fine. After rummaging around in my fridge looking for pesto, I found instead a jar of green olive tapenade which would add a nice depth of flavor, and a tub of local goat cheese. Ready to roll, I heated a few tablespoons of olive oil in a large saute pan and slowly cooked the onion till it was soft, then added the crushed garlic, stirring briskly. 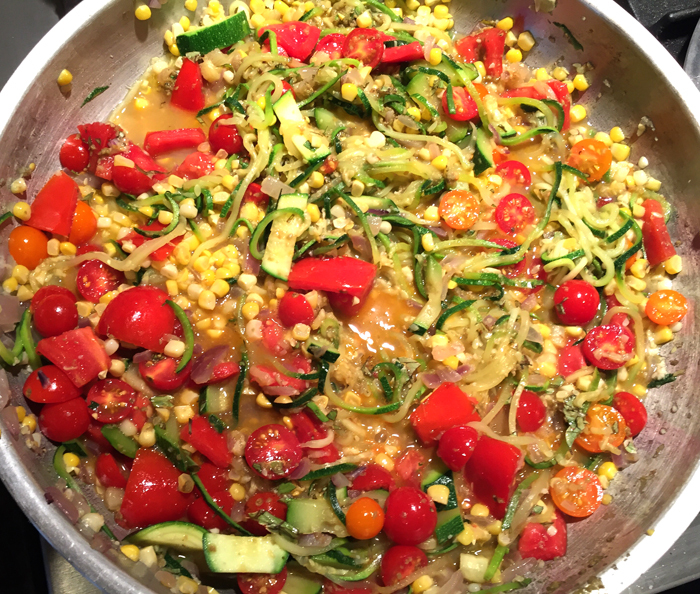 I combined the large, mound of zucchini with tendrils hanging off in all directions and the corn and let it all simmer with a lid on for about five minutes. Once it softened up I finished with the tomatoes and tapenade and cooked just long enough for the tomatoes to warm. I wanted a fresh tomato pasta, not a cooked sauce. Just before serving I stirred in the fresh basil and goat cheese. Wowzer! I tasted it and was blown away - so delicious! Forgot to mention, I cooked the spaghetti squash separately and just added olive oil, salt and pepper for a tasty side dish. This light delicious meal was very satisfying, and so much fun to make. Let your next stop at a local farm stand inspire you to new culinary heights! You might surprise yourself!